No Hurry To ‘Buy The Dip’ in Gold Miners | Energy and Gold Ltd. This time is different in that GDX is in a broader uptrend for the first time in many years. 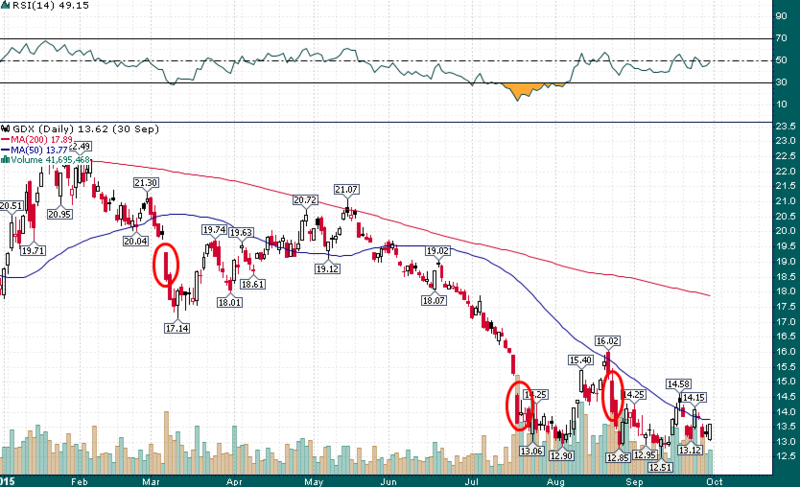 However, that could also mean that GDX has further to fall before finding a robust level of support. Only time will tell, although it certainly doesn’t look like investors should be in a hurry to ‘buy the dip’ in the goldies. The work included in this article is based on SEDAR filings, current events, interviews, and corporate press releases. It may contain errors, and you shouldn’t make any investment decision based solely on what you read here. This publication contains forward-looking statements, including but not limited to comments regarding predictions and projections. Forward-looking statements address future events and conditions and therefore involve inherent risks and uncertainties. Actual results may differ materially from those currently anticipated in such statements. The views expressed in this publication and on the EnergyandGold website do not necessarily reflect the views of Energy and Gold Publishing LTD, publisher of EnergyandGold.com. This publication is provided for informational and entertainment purposes only and is not a recommendation to buy or sell any security. Always thoroughly do your own due diligence and talk to a licensed investment adviser prior to making any investment decisions. Junior resource companies can easily lose 100% of their value so read company profiles on www.SEDAR.com for important risk disclosures. It’s your money and your responsibility.